How many of you own an Instant Pot? I have one and I am in love with it. For those who don't know about Instant Pot; it is a multi use programmable pressure cooker which works as rice cooker, slow cooker, warmer, yogurt maker and more. It has made our life easier where you don't have to worry about overcooked, undercooked or burnt food. 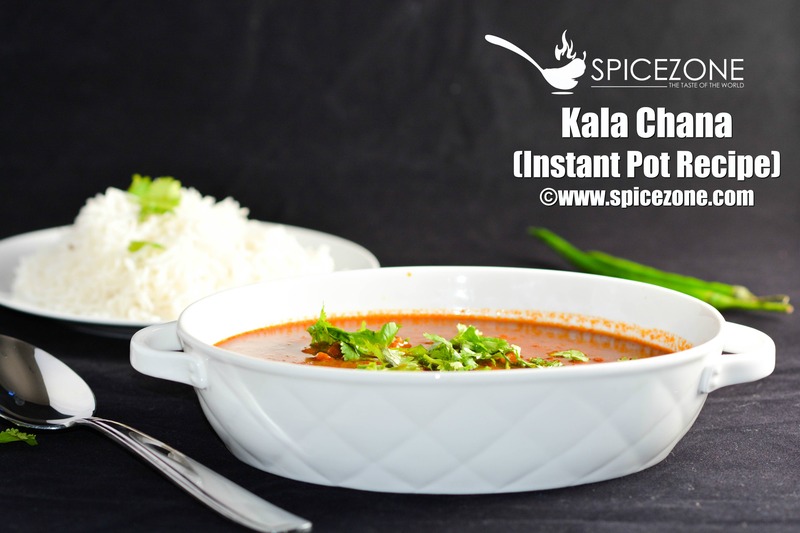 I am bringing you an easy recipe of Kala Chana made in the instant pot. Kala Chana is also known as black chickpeas which are full of protein, fiber and iron. These are similar to the yellow chickpeas or garbanzo beans and are popular in India. One cup of kala chana has 13 grams of dietary fiber. High fiber beans helps regulate your sugar levels, lowers cholesterol and helps prevent constipation. There are different ways to include black chickpeas into your diet, such as making a salad, hummus, or in the form of curry. I have made Kala Chana curry which is a very popular recipe from India. 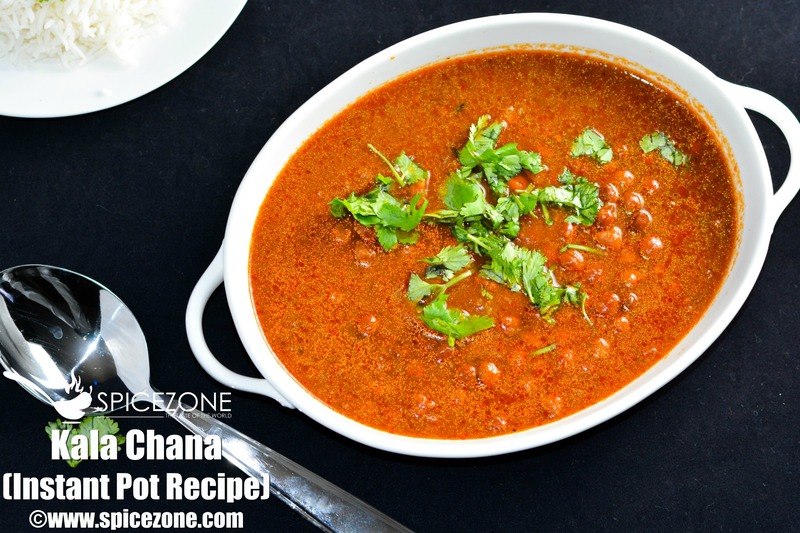 Black chickpeas can be prepared with gravy or dry which we call it sookha chana. These chickpeas are also used for prashad at the end of Navratri without onion and garlic. Do try this recipe and let me know what you think. You can make the same recipe on the stove top if you don't have the instant pot. Soak the chana overnight, if you can't then may be for 5 hours. Plug in the instant pot and press the SAUTE mode. Once you see HOT on the screen, add olive oil to it. Now add sliced onions and let it cook until brown. Add garlic, ginger and green chilies to the onions and saute for additional few minutes. Now let the mixture cool down. In a blender, add the onion garlic mixture along with the tomato puree and blend it into a paste. Now transfer back the mixture into the same pot and saute for a few mins more so that the rawness of the tomato is gone. Add salt, turmeric, red chili powder, cumin powder, garam masala to it. Mix it well. Once you don't smell the raw tomato add paprika to it to. Drain the chana and add to this masala. Mix it well and saute for a couple of mins. Now turn the SAUTE mode off. Heat the water in your kettle, it will speed up the process. Add the hot water to it. Close the lid and turn the vent to SEAL. Now press the MANUAL mode and set the timer for 30 mins. Once the time is up leave the chana in it to Natural Pressure Release (NPR) if you are not in a rush. If you can't wait then let it NPR for a few mins and then open the vent to release the pressure. Check your spices, add it as per your need. Mix it well. Now garnish the Kala Chana with cilantro. Serve hot along with steamed rice or chapati whatever you like along with your favorite pickle. Try this Kala Chana recipe which is full of protein, fiber and other nutrients that can be enjoyed with steamed rice or chapati. Serve hot along with steamed rice or chapati whatever you like. 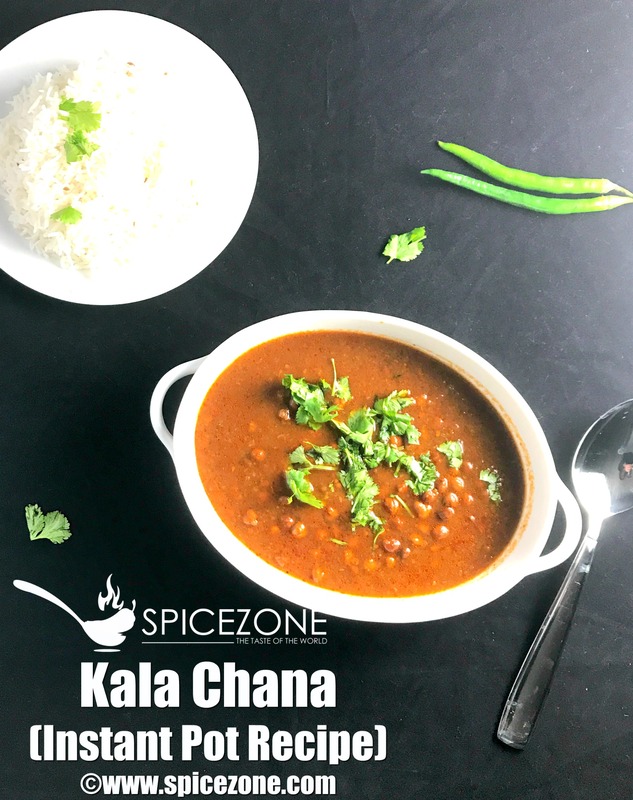 4 Responses to "Kala Chana | Instant Pot Kala Chana Recipe"
Looks so delicious, not to mention easy to make! I’m really craving this chana now! Thank you Tazim. Yes it is very easy…do give it a try..